Kathryn “Katie” Neilson, a junior in materials engineering from Morton, Illinois, has been selected as a 2018-2019 Barry Goldwater Scholarship Honorable Mention recipient. The Goldwater Scholarships are granted to undergraduate sophomores and juniors across the United States based on academic merit in the natural sciences, mathematics, and engineering fields. Neilson was one of two Iowa State University students selected as a Goldwater Scholar with Honorable Mention. “Katie was selected as a Goldwater Scholar with Honorable Mention due to her outstanding academic record, research experience and commitment to leadership on campus. 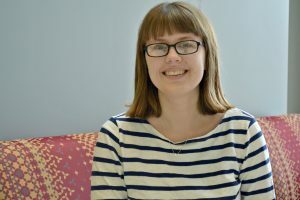 Katie is not only involved in research herself, but is also passionate about engaging her peers in research opportunities which she has worked for through her involvement with student government,” said Laura Good, Assistant Director for Nationally Competitive Awards & University Honors Program. Neilson has extensive academic, research and leadership experience. She has been a research assistant in Dr. Paul Canfield’s Novel Materials and Ground States Research Group at the U.S. Department of Energy’s Ames Laboratory. She was a stress engineer intern for Spirit Aerosystems in Witchita, Kansas, and will participate in the Center for Energy Efficient Electronic Sciences Research Experience for Undergraduates (REU) at Stanford University this summer. Upon earning her bachelor’s degree, Neilson would like to pursue a PhD. She would like to conduct research on magnetic memory or quantum materials devices and work in R&D in the electronics industry. The Goldwater Foundation is a federally endowed agency established by Public Law 99-661 on November 14, 1986. The Scholarship Program honoring Senator Barry Goldwater was designed to foster and encourage outstanding students to pursue careers in the fields of mathematics, the natural sciences, and engineering. The Goldwater Scholarship is the preeminent undergraduate award of its type in these fields. Since its first award in 1989, the Foundation has as of 2018 bestowed 8,132 scholarships worth approximately 65 million dollars. In the 2018-2019 academic year, 211 scholarships were given, and 281 nominees were selected as Honorable Mentions. Students must be nominated by a campus representative. Over 1,280 nominations from 2,000 colleges and universities nationwide were submitted.